Bio: French artist Brigitte Monerie paints familiar scenes of daily life, full of colour and luminosity. All the world’s her stage, and the players act out a story that the viewers must flesh out for themselves. Brigitte spent 14 years in Africa, where she shared in studios and exhibitions at Brazzaville and Conakry - where she taught art to children at the Lycée Français. She also lived in Kinshasa and the exotic and recently inaccessible Ougoudagou. 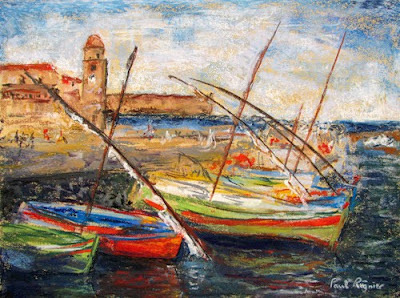 On her return to France she took up pastels and has studied with some of the leading French pastellists. She participates regularly in French exhibitions, and she has amassed at least fifty awards, including the prestigious Prix Blanche Roullier at the Salon des Artistes Français. Her pastel demonstrations have been published in Pratique des Arts and Plaisirs de Peindre. Brigitte lives and works in Touraine and teaches pastel at the Atelier des Couleurs Agiles of Tours-Montjoyeux. 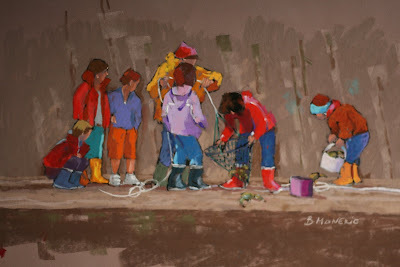 Her paintings are on display in the Gallery Sillage de Sauzon at Belle-Ile en Mer. Medium: Pastel. Brigitte uses pastel for its immediacy – it allows for spontaneous expression of one’s reaction to a scene from life. The figures are not stiff, you catch them in full flight, so to speak, freeze the moment, and imagine them continuing their lives uninterrupted afterwards. Subjects: Scenes of life, rapidly and effectively executed on the spot. I particularly like the children dressed in blue dresses and hats in the Australia section, and the pair of motorbiked duck-vendors together with their misfortunate ducks in the Asia gallery. Style: Stylized or simplified representational. Navigation: All links remain available at side of page, and in the galleries there is a drop-down list at the top right of the viewer that permits easy access to each in turn. Gallery: Australie; Petits formats; Asie; Divers; Afrique; Amérique du sud; Scènes de rue ; Terrasses – Cafés ; Bords de mer; Intérieurs; Marchés. Image View: Thumbnail images may be enlarged individually or viewed in “grand format” which allows one to scroll down through them; they are labelled by title and sometimes size. Download is not possible. Demo/Blog: Not exactly, but Brigitte has posted some pages from her magazine articles. Regular viewers will know that this blog has no commercial interests, accepts no advertising, and has no sponsors. However, for the first time I am offering giclée editions of some of my own work, on premier quality German Etching Paper, in a strictly limited edition of 50 or 100 only signed prints. I have added a new Gallery Outlet page to the site, where the prints are illustrated and listed for purchase. All details of prints, postage and payment methods will be found thereon. Bio: Colorado native Enid Wood was raised in Denver, where she had her first solo exhibition in St. Pauls’s Lutheran Church; worked in England for many years as a violin teacher, and spent summers in Santa Fe. She now lives in Central Texas - she has a studio in Bastrop, and paints full time. She has studied still life and portrait painting with Don Doxey, and landscape painting with Albert Handell. 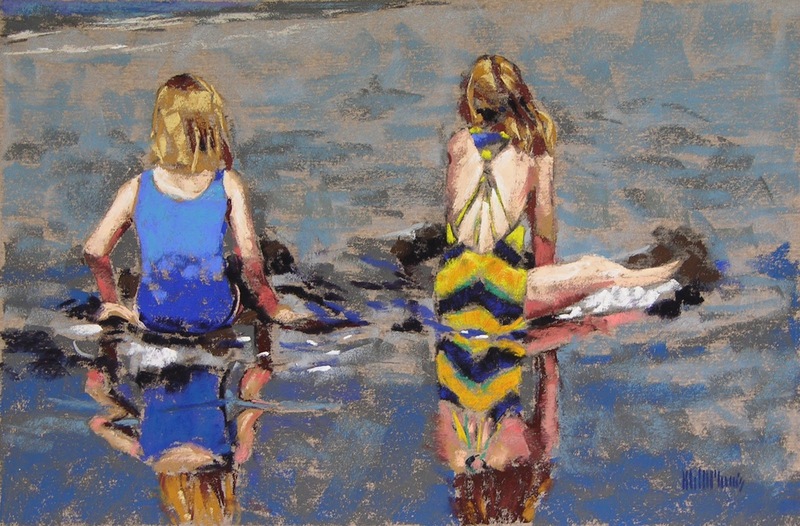 Enid's award-winning paintings (including frequent appearances in the Pastel 100,) are seen in private collections locally, nationally, and internationally. She is represented in Austin by Artworks, at 1214 W 6th Street. Navigation : All links remain available at top of page. Image View: Thumbnails are carefully labelled by title and size ; they enlarge in a viewer and can be scrolled through in this format. Saltmarsh 3 is 12 x 16 ins; 680 x 489. 134 KB. Bio: Donna Levinstone was born in New York in 1955 and is based in Long Island City. Her formal art education took her through SUNY (State University of New York) at Stony Brooke, 1976; the Pratt Institute, 1978; and the Art Students League, 1979. She is a member of the Pastel Society of America. She has been featured in American Artist, and in the Best of Pastel (Quarry 1996); and Landscape Inspirations (Quarry 1997) among others. Levinstone is widely represented in public collections. including the Library of Congress, the Museum of the City of New York, CBS, General Electric, the US Department of State, AT&T, PriceWaterhouseCoopers, Citigroup, Time Inc, the Southern Alleghenies Museum of Art, Nabisco Brands Inc, Columbia House, The Disney Company, The Bristol Meyers Company, Pfizer, The New-York Historical Society and Touche Ross. She has exhibited recently at Graficas Gallery, Nantucket, and the Jeffrey Leder Gallery, Long Island, New York. Medium: Pastel. 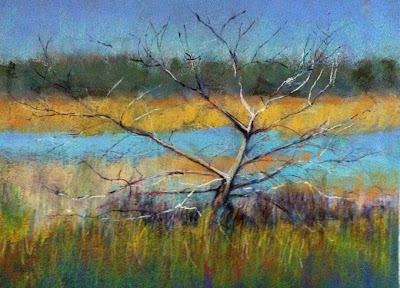 Using Diane Townsend pastels on white Stonehenge paper, Levinstone captures the weight and essence of nature’s different components through a process of additions and substractions. 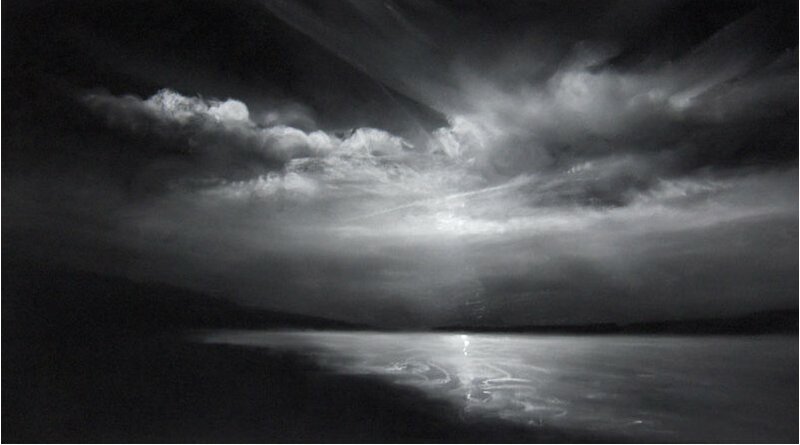 “As I layer my drawings with darkness and light, I explore the powerful forces of nature as well as its beauty. I examine the dualities of light and dark, calm and volatile and ethereal and permanence.” Levinstone went through different materials and sizes until she reached a vocabulary that ranges between impressionism and photorealism to express her fascination with sky and water. She invites the viewer to explore the duality of what is permanent in our world and what is ever-changing. Style: Levinstone’s current work is centered around the relationships between tranquility and volatility, the ethereal and the earthly, light and dark, and night and day. Through the reflected light in her atmospheric drawings, Levinstone invites the viewer to explore the duality of what is permanent in our world and what is ever-changing in it. Image View: Thumbnails enlarge in Flash viewer and cannot be downloaded. Bio: French pastellist Nadia Turpault was born in 1969. She lives and works in Suresnes, France. Her training as a graphic artists has allowed her to express herself in diverse forms of communication. Her passion has had her take life drawing courses in a number of studios. Pastel has become her medium of choice. She is heavily involved in the Suresne artists association, where she has established a drawing course for children as well as a life drawing studio. She exhibits frequently in the Hauts-de-Seine region, and won the Prix de Municipalité de Suresnes in 2001. Her work has been featured in the French art journal Artistes, issue 99. Style: Representational. Of her paintings of children, fellow pastellist Christine Narbonne has this to say: Là, je suis tombé amoureux des portraits que Nadia interprète à sa manière… Tout est dans le regard de ces petits enfants : Tantôt tristes, tantôt rêveurs ou aux aguets. Les expressions de leurs visages sont si vivantes, figées dans un moment crucial. De plus, on lit leurs interrogations, ils nous interpellent en nous fixant de leurs yeux vifs. Comment ne pas tendre la main vers ces mômes qui nous regardent, comment rester de marbre devant ces véritables instantanés de reporters ! C’est beau, irrésistible. Navigation: This site is in French, nicely presented. Links remain available at side of page. Gallery: Nouveautés (recent work); Paysages urbains (cityscape); Serie Coussin (Cushion series); Regardes (Faces); Paysages (Landscape). Image View: Thumbnails may be enlarged in a viewer on the page, but not saved. Information on dimension is sometimes provided. The image above is from her Cushion Series. Bio: Paul Régnier was born in 1943; his interest in painting manifested itself early, and aged 11 his parents gave him a correspondence course in drawing, whence he never looked back. His profession as fashion designer, with lines of complementary jewellery, were an ideal outlet for his creativity. He continued meanwhile to paint, in the main self-taught. This led him to the discovery of pastels, whose colours and immediacy of touch won him over. Paul Régnier is a member of Art du pastel en France, and the national association of wildlife painters based in Bry sur Marne. He is also a member of the National Association of french Artists (l'Association Nationale des Artistes Français). Navigation: Site is in French. Links remain available at top of page. Gallery: Les oeuvres récentes (recent works); Les Personnages (People); Les Etudes (studies); Les Nus (nudes); Les Animaux (animals); Les Fleurs (flowers); Les paysages (landscapes); Les Villes (towns); Les Abstraits (abstract). Image View: There are several pages of thumbnails in each gallery; thumbnails enlarge in a viewer on the page, and may be saved. Full information on title, and dimension is provided. Collioure is 30 x 21 cms. 500 x 372, 86 KB. Bio: I might have posted on Margot Schulzke a lot sooner if I was not somewhat in awe of her. Margot is a major figure in the world of pastels, both for her art and for her writing on pastel – she has been a regular contributor to the Pastel Journal since its foundation. (For a full list of her writing, check her website.) 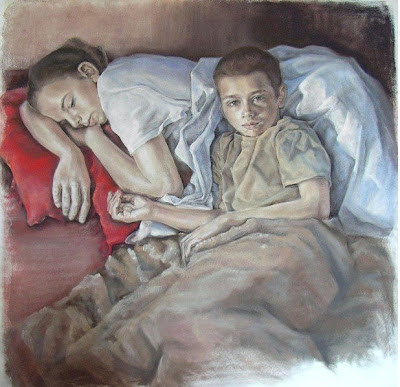 She has taught painting for some forty years and holds a BA degree in art education. Margot has been showing her work - and winning awards - since the early 1990s. The Pastel Society of the West Coast has ranked her as a Distinguished Pastellist since 1988, an honor extended to only 26 of PSWC's approximately 400 members. In 2006, the society added another signal honor, that of the PSWC Pastel Laureate Award. She is listed in Who’s Who in America, Who’s Who in American Art, and in Who’s Who in American Women! She has served as a juror for many exhibitions, including The Pastel Journal Pastels 100. Margot’s paintings were featured in the December 2008 issue of the Pastel Journal. The article by Christine Proskow focuses on her signature theme of cityscapes and interiors. 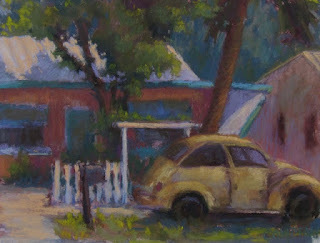 Margot works from her studio in Auburn, California. Subjects: Landscape – especially cityscape; Interiors; Figures. Publications: A Painter's Guide to Design and Composition, North Light Books; 2006. ISBN-10: 1581806434 ; ISBN-13: 978-1581806434. Margot has also been included in many other books, including as The Best of Pastel, The Best of Pastel II; Landscape Inspirations (the three latter published by Rockport); and Pastel Interpretations, by Madlyn Ann Woolwich, North Light, 1993. Navigation: Links remain available at top of page. The site is easy to navigate and the gallery pages are exemplary – as one might expect! Gallery: Figures and Portraits; Landscapes and Seascapes; Cityscapes and Gardens. Image View: There are several pages of thumbnails in each gallery; thumbnails enlarge in a new page, and may be saved. Full information on title, and dimension is provided. 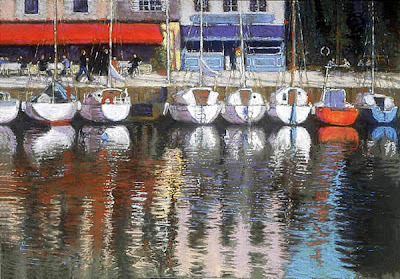 Honfleur, the Inner Harbour, is 16.5 x 24.5 ins, 600 x 418, 73.6 KB. Blog/Demo: Not exactly, but go to http://www.margotschulzke.com/studionews.html to download her bimonthly newsletter. Bio: Originally from Connecticut, Eden Compton’s formal art education began with a BA in Art History from Colgate University and independent courses at the International Center for Photography in NYC. She has studied with Master Pastelist Doug Dawson and taken workshops with nationally known artists including Alan Flattman, Lois Wooley and Colin Page. She has been painting full time since 2003 and was the artist in residence at Hawk’s Cay Resort in the Florida Keys for two years. 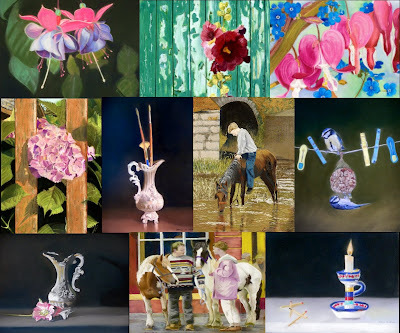 Her award winning work has been included in numerous national juried shows including the Catherine Lorillard Wolfe Art Club, Salmagundi Art Club and the International Pastel Society as well as numerous regional and local shows. She is a member of the Connecticut Pastel Society, the Cape Cod Pastel Society, Connecticut Plein Air Painters Society and Florida Plein Air. She is also a juried member of the Degas Pastel Society and Oil Painters of America. Gallery: Works: North East Landscapes; Southern Landscpes; Figurative and Markets; Cityscapes. Image View: Gallery thumbnails enlarge in a new page. Thumbnails are named on mouseover and the medium and dimension is usually included. Florida Bug is 9 x 12 ins, 640 x 486, 90 KB. Bio: Mary McInnis was born in Richland, Washington State, in 1957. She grew up in West Seattle and now resides in Port Orchard, WA, just across the water from her childhood home. She had an early interest in art, attending the Cornish School Saturday Art Sessions while in junior high. She continued to explore making art, stage work, choral, film, and photography through high school. She later continued with art, stage, choral, photography, and design in college, culminating in a Bachelor of Fine Arts in Painting at the University of Washington in 1987. Since then she has taken classes and workshops with Wolf Kahn, Bob Gerbracht, Albert Handell, Bob Rohm, Desmond O’Hagan and Richard McKinley. Mary has traveled extensively throughout the USA and the world. She has shown her work in numerous group, solo, juried, and invitational shows. She is a member of the Northwest Pastel Society and the Peninsula Art League. She has been an Illustrator and Photographer for Seattle Opera. 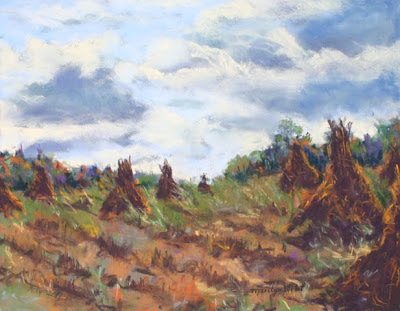 Bio: Indiana artist Marilyn Witt started painting after her family were grown. She returned to school at Indiana University East and studied art under the instruction of Tom Thomas and attended workshops and classes around the US, coubting among her instructors Ron Mack, Robert Eberle, Ray Stevens, Nancy Foureman, and Doris Turnbaugh. Her pastels have been winning awards for ten years now. Medium: Pastel, oil, watercolour, photography. Subjects: Landscape, still life, figurative. Style: Representational, with an impressionist bias. Often paints plein air.